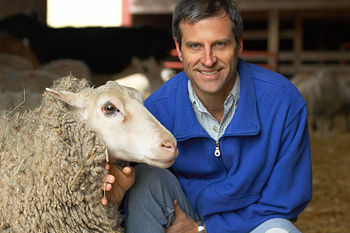 Gene Baur is president and co-founder of Farm Sanctuary, the first animal rescue organization dedicated to farmed animals. He is vegan and has been at the forefront of animal protection since he began the Sanctuary in 1986. He holds a bachelor’s degree in Sociology from California State University, Northridge and a master’s degree in agricultural economics from Cornell University. In the 1980s, Gene began investigations into factory farms, stockyards, and slaughterhouses. Gene felt the conditions he observed were unacceptable, and these experiences helped motivate the creation of Farm Sanctuary. The sanctuary’s first rescued animal was a downed sheep found on a pile of dead animals behind Lancaster stockyards in 1986. He also participated in the efforts of human rights, animal rights, consumer and environmental organizations. Gene’s investigative exposés and advocacy efforts on behalf of farm animals have earned international media coverage, including ABC, NBC, CBS, CNN, the Los Angeles Times, and the New York Times. In 1996, The Peace Abbey awarded Gene with its Courage of Conscience Award. In March 2008, Gene released a book entitled Farm Sanctuary: Changing Hearts and Minds About Animals and Food. It has appeared on the Los Angeles Times and Boston Globe bestseller lists and was named to Booklist’s Top 10 Sci-Tech Books: 2008. Gene appears in Peaceable Kingdom, a film made about Farm Sanctuary and the people who support Farm Sanctuary. Farm Sanctuary claim that “legislative reform complements our aspiration to achieve a world free of the violence visited daily upon farm animals in animal agriculture” and, “Incremental improvements are steps in a larger process. Given this, Gene has been supportive of a number of controversial animal welfare reforms, including Proposition Two. ARZone: Hi Gene, and welcome. What are the goals, both short term and long term, for Farm Sanctuary; what is its mission and what are you most proud of? Gene Baur: Thank you. It’s nice to speak with you here. In the short term, Farm Sanctuary is working to raise awareness about the abuses of animal farming and the benefits of vegan living, as well as to outlaw some of the worst factory farming cruelties while rescuing and caring for individual victims of the animal farming business. In the long term we seek to reshape our relationship with other animals so they are regarded as friends, not food. We believe that all animals deserve to be treated with respect and compassion and we oppose the commodification of sentient life. I am most proud of the impact Farm Sanctuary has had in causing citizens to rethink how they relate to other animals, and specifically to choose vegan foods instead of animal based foods. We are in the midst of a burgeoning food movement in the U.S. with a growing interest in farmers markets, community supported agriculture programs, and community gardens where fresh, local plant foods are readily available. And, we’re seeing more vegan foods available in restaurants and supermarkets as well. I’m proud of the role Farm Sanctuary has played in moving people toward more plant based eating. Many view veganism as a moral imperative, that is to say, it is something that we ought to do, even if doing it would cost us something dear. Would you explain what veganism means to you? Veganism is living in the most compassionate way possible, and to me, it’s a moral imperative. I wish everybody saw the world as I do, but I recognize that different people are in different places on the spectrum. I believe it’s important to make veganism inviting and attractive and to be inclusive, rather than exclusive. I see veganism more as an aspiration than a destination. For example, I buy organic produce, but it might be grown with animal manure and slaughterhouse by-products as fertilizers, so technically, one could say that eating organic produce isn’t vegan. Rather than fixating on this imperfection, I accept it for what it is, while also doing as much as I can to support and promote veganic agriculture. On your Farm Sanctuary website, it states, “ACT advocates for laws and policies that prevent suffering and promotes compassion by reaching out to legislators, businesses, restaurants, veterinarians, media and other influential members of society.” But film after undercover film reveals that no one is even following the existing laws. The word “vegan” is rarely used on your site, but it would seem the rational way to help farm animals – by ending the demand for their bodies. Why is veganism (vegan education) not a clear position of Farm Sanctuary rather than working with legislators? Supporting veganism is a clear position of Farm Sanctuary, and our hope is to create a vegan world. There are many ways to promote veganism without explicitly using the word ‘vegan’. For example, telling the stories of rescued animals at Farm Sanctuary connects people with the fact that these are sentient creatures – they are friends not food. This is a way to promote and model veganism without labeling it as such. Undercover video has done a lot to educate people, and when it leads to legal prosecution, it legitimizes that abusing animals in certain ways is unacceptable in our society. We work both to expose abuses and then to prohibit them legally. I believe each of these activities helps raise awareness that farm animals are sentient beings whose lives matter, which in turn helps spur people to think and question whether they should be eating animals in the first place. To follow up, isn’t there a danger in emphasizing treatment rather than use? If people think there is a “kind” way to raise and slaughter animals, they will not change their attitudes towards their intrinsic value? I think speaking about treatment gets us to the bigger question of use. Your first rescued animal was a “downed” sheep found on a pile of dead animals behind Lancaster stockyards, in 1986. At the time, what was your motivation for being at the slaughterhouse? In 1986, there was very little attention or awareness about the suffering experienced by animals exploited in agriculture. I felt that it was important to witness first-hand what was happening to become informed so I could educate others, campaign for changes, and rescue individuals from time to time. Hilda was rescued from a dead pile behind Lancaster Stockyards in 1986, and she lived with us for more than 10 years. Part of the Californian Proposition 2, which you supported, involved the banning of veal crates. When this proposition was passed, it was referred to as an historic victory. Could you please explain why it was regarded as a success, and what happens now to the male babies of cows born on a dairy farm? Yes, Proposition 2 bans the use of veal crates, gestation crates and battery cages in California. It will lessen the suffering of 20 million animals and it also led to a law in California prohibiting the sale of eggs … from conditions that don’t meet the requirements of Proposition 2, so it will impact animals in other states too. Despite millions of dollars spent by agribusiness to defeat Proposition 2, voters supported it by a 2 to 1 margin, and sent a powerful message to agribusiness that factory farming practices are outside the bounds of acceptable conduct. Proposition 2 also raised awareness about the importance of treating other animals with respect, and ripples are now being felt across the U.S. Proposition 2 focused on specific inhumane confinement practices, but there are many other problems that need to be exposed and stopped, including the sad fate of unwanted calves born on dairies. Baby male calves born on dairy farms in California are sometimes killed within a couple days of birth for ‘bob’ veal, or increasingly, they are being raised to be killed as beef. Gene, many have been impressed with and inspired by the book you wrote. Many also think it’s wonderful the undercover and rescue work Farm Sanctuary does for “farm” animals. As the multi-million dollar organization you have become, however, do you feel an element of status quo may have crept into your decision-making? That possibly the undercover and rescue work you do has quietly morphed into more of a front for the purposes of maintaining a high donor base? That possibly your mission, rather than being one of sincerely trying to end the injustices to “farm” animals, has slipped into one that is more vested in income for income’s sake (possibly even from big agribusiness? On the one hand, you can care so much about “farm” animals, yet on the other hand, campaign for weak, minimalist legislation, then publicize victory announcements, knowing that cumulatively these strategies end up resulting in people feeling more comfortable consuming animals, not less, due to the public being led to believe the legislation is bringing about more humane treatment of the animals. I disagree with the notion that welfare reforms cause people to feel more comfortable about consuming animals. In fact, empirical evidence suggests the opposite. Welfare reforms lead to more awareness about the issues, which leads people to eat fewer animal products. The number of animals killed for meat in the U.S. has leveled off (and might even be dropping) after decades of annual increases. This reduction in meat consumption coincides with recent, effective welfare reforms. I believe that welfare reforms are steps that reduce suffering in the short term, and move us toward a vegan world in the longer term. Farm Sanctuary is committed to combatting the injustice and suffering endured by nonhuman animals who are abused in the food industry. We oppose agribusiness’ notion that animals are mere commodities to be exploited for profit. We oppose ‘factory farming,’ which we define as an attitude that commodifies sentient life. Farm Sanctuary’s report summary “Truth Behind Labels”, concludes “According to Webster’s Dictionary, ‘humane’ means ‘characterized by kindness, mercy or compassion.’ Commodifying & slaughtering sentient animals is incompatible with this definition.” Given this acknowledgement, aren’t legislative or negotiated measures to reform (and thereby prolong) the institutional slaughter of other animals incompatible with the humane treatment of them? Our position is that commodifying and slaughtering sentient animals is incompatible with the definition of ‘humane’. I’d love to wave a magic wand and wake up in a vegan world tomorrow, but unfortunately, societal change usually happens incrementally, over time. We need to be patient and persistent. Welfare reforms assert that animals have feelings and interests that need to be taken into consideration. I think the logical extension of this attitude leads to veganism. Legislation and other efforts to prevent cruelty help spur ethical discussions about how we treat other animals and ultimately about whether we should be eating them. When people begin thinking about these issues seriously, and when they recognize that humans can live well by eating just plants, I believe most will want to make ‘humane’ choices. I believe a key part of our goal is to promote and support choices that align people’s actions with humane values. As more people make compassionate choices, others will emulate them. Humans are social animals and we are influenced by those around us, so it’s important for vegans to serve as positive role models. Compassion can be contagious. When you rescued that first discarded sheep, did you have any idea Farm Sanctuary would become so important? Why do you feel Farm Sanctuary is so popular? When Farm Sanctuary started, we had no idea how much the organization would grow or the impacts we’d have. I’m very proud of what we’ve accomplished over the years. There is more momentum now than ever for ending factory farming and promoting vegan living, but we still have a long way to go. I think people respond positively to Farm Sanctuary’s work, because it is about transformation, taking horrible situations and creating beautiful outcomes by saving animals from slaughter and providing a sanctuary. As the animals are rescued and healed, so are we. In the Farm Sanctuary websote, there is the following claim: “Ending factory farming as we know it will save countless animals and spare our fragile ecosystem significant stress.” I can just about see how there ~may~ be ecosystem benefits but why would ending factory farming save a single nonhuman individual? Industrialized animal agriculture exploits animals by the billions. Slowing down the factory farm machine and the massive consumption that goes along with it will result in a reduction in lives being taken. To follow-up, the context of this quote is talk of cultural speciesism and also legal welfare moves which you support. From previous answers, and as a sociologist, you are clearly aware of the need for fundamental social change and the suggestion that welfare reforms act against that change. If people reject factory farming and instead use animal products from less intensive systems without cultural change, surely the same number of animals will be killed? I think fewer animals will be killed in a less industrial system. But, I also agree that we need to aim toward fundamental cultural change. It needs to be addressed on both the supply and demand side of things. I agree that animals should be seen as sentient beings with whom we share the planet, not things or products. Unfortunately, other animals, especially those killed for food, are legally and culturally treated mainly as things or products. We need to change that, and I believe recognizing that they have feelings and interests is part of that process.. Many people can’t reconcile donating to an organization whose legislative initiatives contribute to the continuation and increase of “farm” animals being used as objects of production. Would you say whether you would be willing to campaign first and foremost for veganism as the best and most effective means of helping animals? Farm Sanctuary’s influence could have such a positive effect in this direction…for the animals. I don’t believe campaigning for laws to ban certain cruelties contributes to the increased commodification of sentient life. In fact, it helps raise awareness and depresses demand for meat. Farm Sanctuary promotes vegan living, and we also work to expose and outlaw cruelty. Both efforts lead in the same direction. Farm Sanctuary calls itself an “animal protection” organization and, as far as I can tell, not an animal rights organization. Would you please explain what the difference is and why Farm Sanctuary calls itself the former and not the latter? There has been an unfortunate and unhealthy division within the animal protection movement, and people sometimes feel they have to choose between animal rights and animal welfare labels. When asked if Farm Sanctuary is an animal rights or welfare organization, I say we’re both. I don’t believe that rights and welfare are black and white distinctions, but rather exist on a continuum. The animals living at Farm Sanctuary have rights, but we also want them to have good welfare. Animal protection is a more inclusive term that avoids what has come to be unnecessary divisions that sometimes come with rights vs. welfare labels. To follow-up, as a sociologist, you must think about claims-making? Is it possible to make claims about animal rights while negotiating welfare reforms? Some would say that passing laws is explicitly giving animals ‘rights’ not to suffer in certain ways. Again, I believe welfare reforms and rights exist on a continuum, with the former leading ultimately to the latter. How much of a factor are government subsidies, in the form of direct payments as well as “animal science” programs and the like, to the economic viability of the flesh, milk, and egg industries? Since Farm Sanctuary is active in political campaigns on behalf of animals used for food, have you considered campaigning to cut these subsidies? Government subsidies are a very important area of concern. I believe if these were eliminated, animal foods would be much more expensive and animal agriculture would not be economically viable. Yes, Farm Sanctuary is interested in cutting these subsidies and have had some success. When the last Farm Bill, which directs farm policy in the U.S., was addressed we identified a $12 million subsidy to the veal industry that we were able to get removed. The Farm Bill will be coming up again in 2012 and we’ll be looking to remove support for animal agriculture. Farm Sanctuary seems very successful both in terms of the number of supporters it has and also financially. Well done. Isn’t it time to drastically increase the amount of land you own so that you can save a lot more nonhuman animals? Farm Sanctuary operates two sanctuaries, one in Watkins Glen, NY and one in Orland, CA. We currently care for about 1000 animals. The animals at our farms are ambassadors whose stories help raise awareness and inspire vegan living. It is not possible for any sanctuary to rescue all the animals so we engage in education and advocacy efforts beyond the shelter. We’re open to expanding our shelters and possibly to having a facility closer to a large population center, but even if we rescued a million animals a year, it would still be a drop in the bucket when we consider that 10 billion land animals are slaughtered ever year in the U.S. Some studies have shown meat consumption is at an all time high, and rising (look at all the two dollar burger specials at fast food restaurants). With that said, would you agree that animal use and cruelty, at this present moment, is at an all time high, and only rising? In the U.S. USDA stats show that animal consumption is not increasing, and may be decreasing. I agree, there are problems with global meat consumption increasing. Do you (speaking for Farm Sanctuary) stand by the Whole Foods Market, Farm Animal Compassionate Standards that Farm Sanctuary endorsed (with a number of other groups and Peter Singer) in 2005? That program has changed, and the word ‘compassion’ isn’t being used anymore. Farm Sanctuary continues working on reforms as well as promoting vegan living. We don’t believe these efforts are in conflict. How then can Farm Sanctuary condone Whole Foods (or anyone’s) business practices of exploiting animals, in any form, when that’s the very problem? In other words, how can you condone exploitation and killing of animals for Whole Foods? We don’t condone any killing, at Whole Foods or elsewhere. Would you please explain further how talking about treatment will inform the public about ceasing the use of animals. Recent stats seem to indicate just the opposite is happening. The evidence I’ve seen indicates that with discussion of welfare, meat demand is depressed. Too often, people consume animals without thinking much about it. Welfare campaigns get the discussion going. You’ll know that most of the answers you have given would be severely criticised by those who adopt Animal Rights: The Abolitionist Approach? Have you spoken to them – and have you thought of taking up Francione’s challenge to debate people such as yourself? I’m happy to speak with Gary or anyone else about these issues. I’m an abolitionist, but have a different view of how to get there than some others. We can learn from each other. Different opinions are healthy, as long as everyone is willing to listen to others. You state “meat demand is depressed”, by what evidence are you referring to? There was a published study done by Kansas State (I believe) making that case. Also, USDA statistics are hard evidence. When veganism and ending animal use is mentioned, people talk about treatment anyway, in order to try and dilute the message and get approval of their consumption of “humane” or “compassionate” animal products. If you want people to stop exploiting animals, why not just be honest and up-front about it from the very beginning and have a high-profile and well-funded consistent “Go vegan” campaign? Why has the mainstream animal rights movement NEVER done this? Moreover, why does the mainstream animal rights movement blatantly marginalize those of us who want vegan advocacy & education to be the *primary* tactic of the animal rights movement? Why are we called “fanatical” or “fundamentalist” or “idealistic” or “divisive” or whatever by leaders in this movement? Vegan advocacy is far cheaper, more direct and honest, and will result in more people going vegan than any reform campaign can ever hope to achieve. Won’t you agree?. Also, if you want to attack the supply side, why not do that honestly, too, and consistently demand the immediate and unconditional release of all animals from their slavery (just like a human rights campaign would do), rather than simply demanding some reforms? Why not send a CLEAR message of veganism to address the demand-side and abolition to address the supply-side, rather than spend 30 more years diluting the issue? Farm Sanctuary is straightforward about promoting veganism, and we’ll continue doing so in the most effective way we know how. We work with vegan food companies, and also try to slow down the factory farming machine. One agribusiness ad campaign can be larger than the budget of the largest animal groups in the U.S. We need to be tactical and creative about creating change. What do you think about people like the ALF? Can they be part of the solution? Sure as long as nonviolence and compassion drive the action.